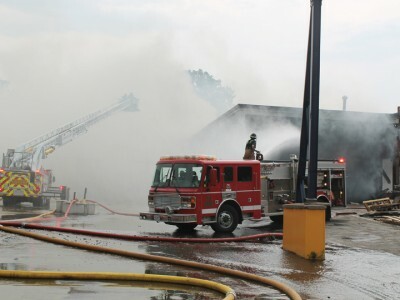 London firefighters spent most of Tuesday morning (July 3) battling a stubborn fire at the abandoned Rich-Wood Kitchens Ltd. building north of Dundas Street between McCormick Boulevard and Nightengale Avenue. Officials believed the fire started when demolition crews were cutting steel girders in the building and sparks landed on combustible materials below. Sparks from cutting tools used by demolition crews dismantling steel girders are being blamed for a major fire at the former Rich-Wood Kitchens building north of Dundas Street between McCormick Boulevard and Nightingale Avenue Tuesday morning (July 3). London Fire Department Deputy Chief Brian George said crews were cutting the girders for the purposes of recycling the steel when sparks landed on a pile of combustible materials below, igniting a blaze just after 9 a.m. that unleashed thick smoke into the surrounding area for several hours. Industrial buildings and businesses to the north and east of the burning building were evacuated due to the thick smoke. Emergency officials said, however, surrounding residential neighbourhoods were not evacuated as the smoke was dissipating as it drifted north and east. Workers at the LorDon Sheet Metal Fabricators building next door to the Rich-Wood building watched as firefighters assaulted the blaze using ground and aerial water streams. George Gallant, owner of the LorDon building, said roughly 75 people were working at his facility at the time and everyone was able to exit safely. Gallant said the partially demolished Rich-Wood building was vacant for about two-and-a-half years and crews began tearing down the structure three or four months ago. “Ironically, they were knocking it down due to the fire risk,” he said. George said fire crews had to attack the fire in a “defensive” manner since the structure was already unstable due to demolition work. He added the fire was causing walls on the north and east sides of the building to buckle and there were concerns of a partial collapse of the structure. Asbestos had been removed from the building prior to the start of demolition work, George said, and there were not any dangerous chemicals present in the structure at the time of the fire. He also said firefighters had recently toured the Rich-Wood building as part of “preplanning” activities for fighting fires in abandoned industrial buildings. George said workers from nearby buildings who evacuated were allowed back to work at 1 p.m. as fire crews had put out most of the fire by that time. There were, however, a few lingering flames and hotspots in a rubble pile within the structure, he added. The district chief on scene consulted with the building’s demolition supervisor who had one of his workers extend the arm of an excavator into the structure to break up the rubble pile so firefighters could douse the last remaining pockets of fire. Some crews were left on scene late into the afternoon to watch for any flare-ups, George said, and the last of the firefighters left the site just before 5 p.m. 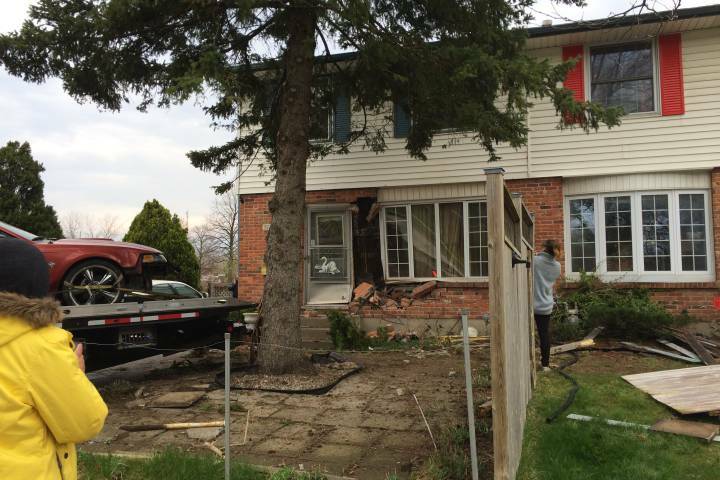 He added the City of London issued an order for demolition crews to knock the structure in on itself as a safety precaution.